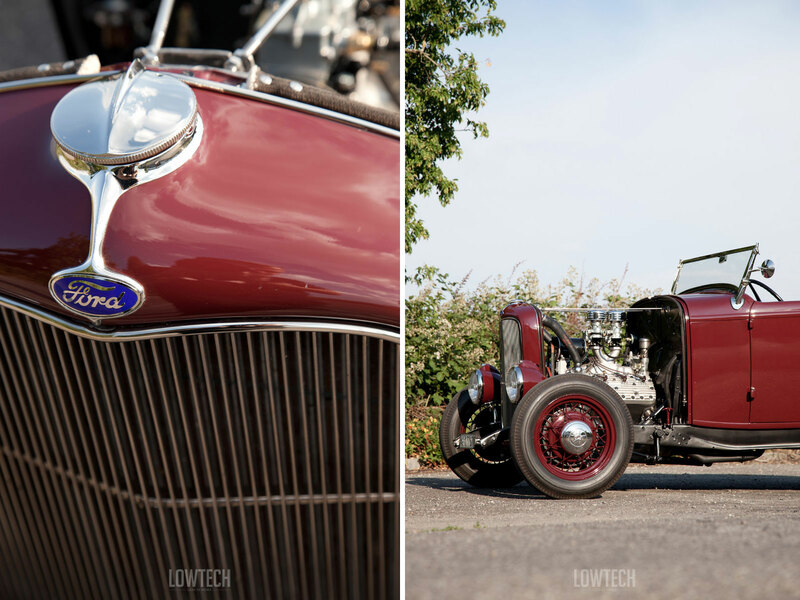 Even in his wildest dreams, good ol’ Henry would have never imagined this: More than 80 years after production ending, his 1932 Ford Roadster is still highly sought after. 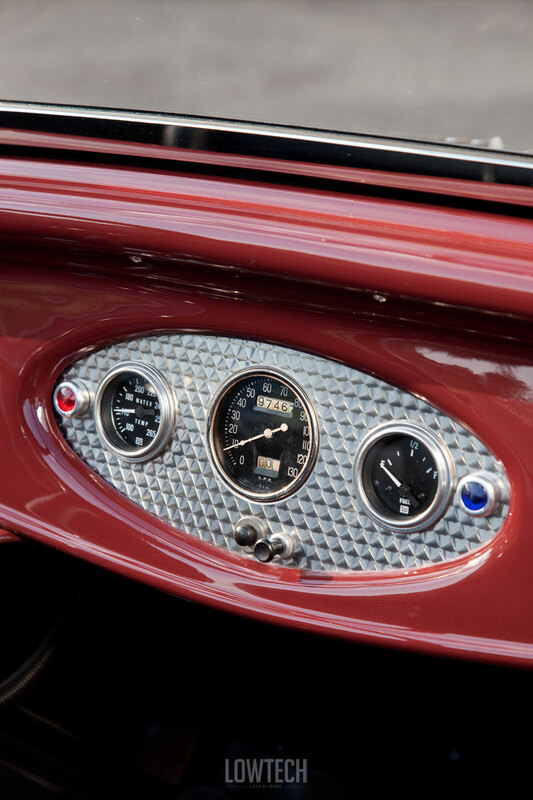 And it actually is so desirable, that it’s being reproduced – or at least most of its components. With only a few exceptions like the flathead V8 or the rear end. 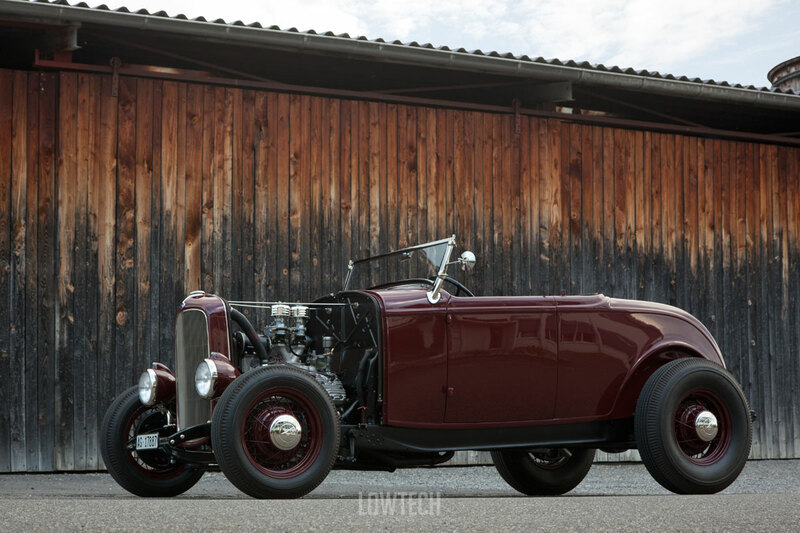 So, if you're longing for a brand new deuce roadster, it's only a couple parts orders aways. And a lot of hard labor, of course. 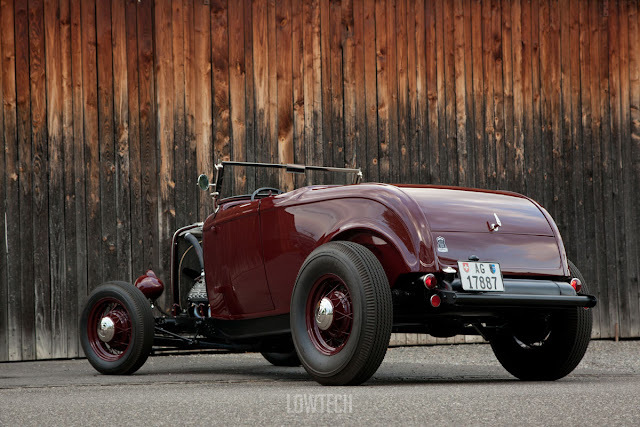 No wonder there are rumors like there might be more deuce roadsters on the road today than Detroit ever produced. But as we all know: different strokes for different folks. And reproduction parts ain't everyone's cup of tea. 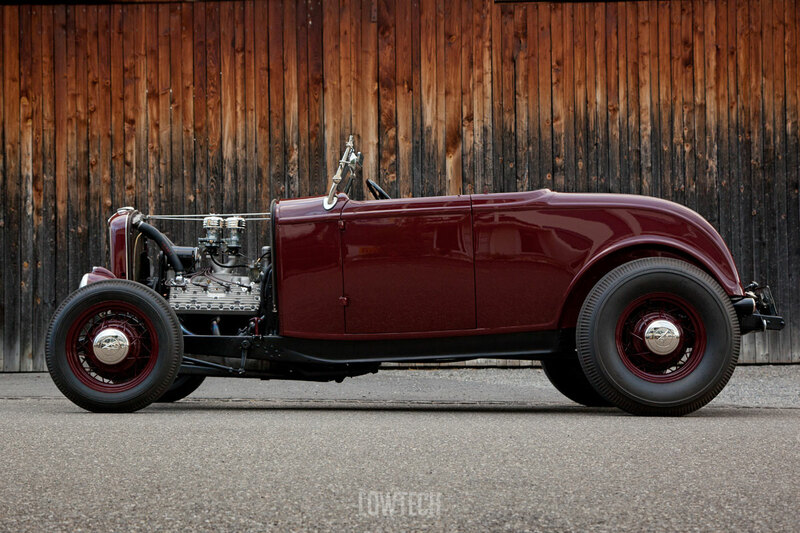 But we also know that not everyone has the means – and/or the patience – to finance an original deuce roadster. So, whatcha gonna do, son? 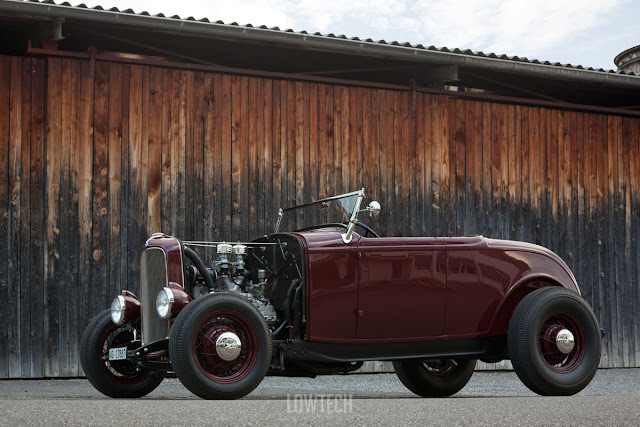 Maybe you could follow the mantra of Jürg Seeberger's 1932 roadster: as original as possible, and as few repop parts as necessary. 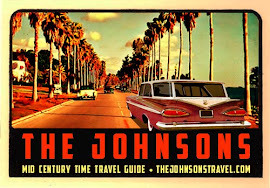 And this is kind of the way to go if you want to end up with a pretty authentic but still affordable deuce. We must admit: Jürg is a lucky fellow. He managed to find the ideal foundation for his dream, a freshly built roadster, featuring an original 1932 rolling chassis and a Brookville steel body. 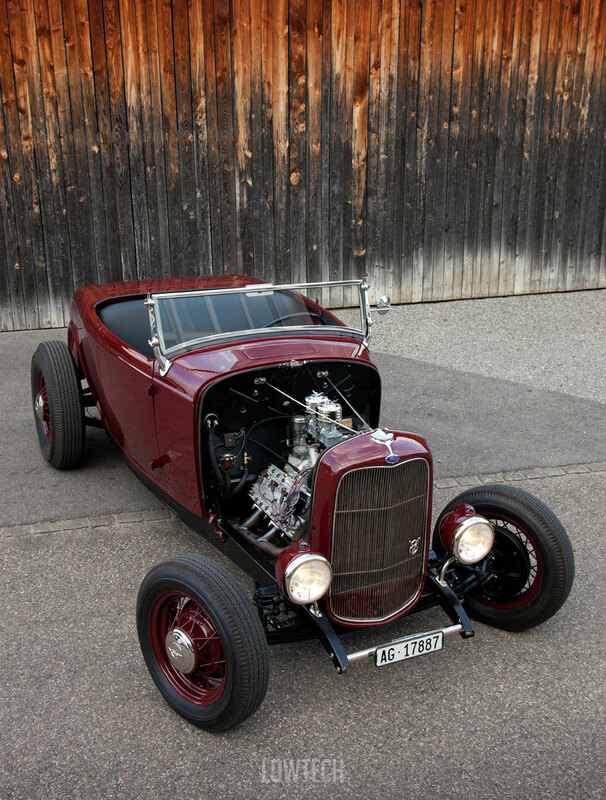 The roadster had been built in Germany and changed hands several times before it ended up in Jürg’s shop. It didn’t have an engine when Jürg bought it, but he knew he would want to change several details anyway in order to make it his own. To start with, Jürg completely disassembled the roadster. The frame was sandblasted, some rust was repaired and it was zinc coated before being painted semi-gloss black. Jürg didn’t want it to look like new, so he wouldn't go over the top restoring the frame. 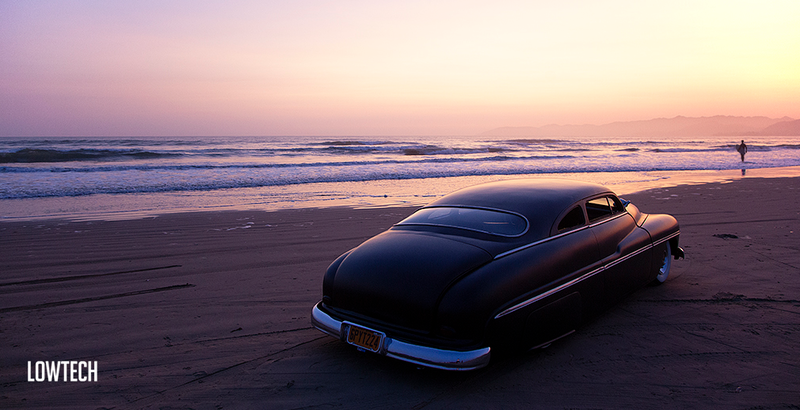 Some dings and imperfections were kept as they provide the soul to an otherwise very clean build. Jürg is eager to stress that all of the suspension parts as well as the axles and brakes are original 1932 Ford material. 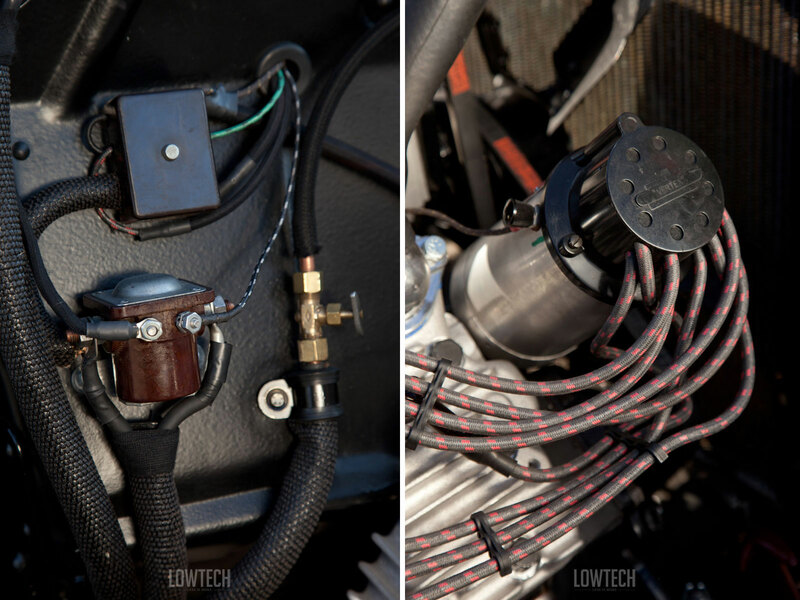 When it came to choosing the engine, Jürg also opted for a clever compromise between original and new: a French flathead. This license build of an American flathead V8 was used by the French army in their trucks up to the mid 1980s. And until today, they can be found as new old stock replacement engines. Only a few changes are necessary to adapt the Frenchie to his new civilian life, but it’s definitely worth it. It’s still less of a hassle than fiddling with an old US-flathead from obscure sources. Jürg decided to bring his newly acquired French Flathead to Adi’s Speed Shop. 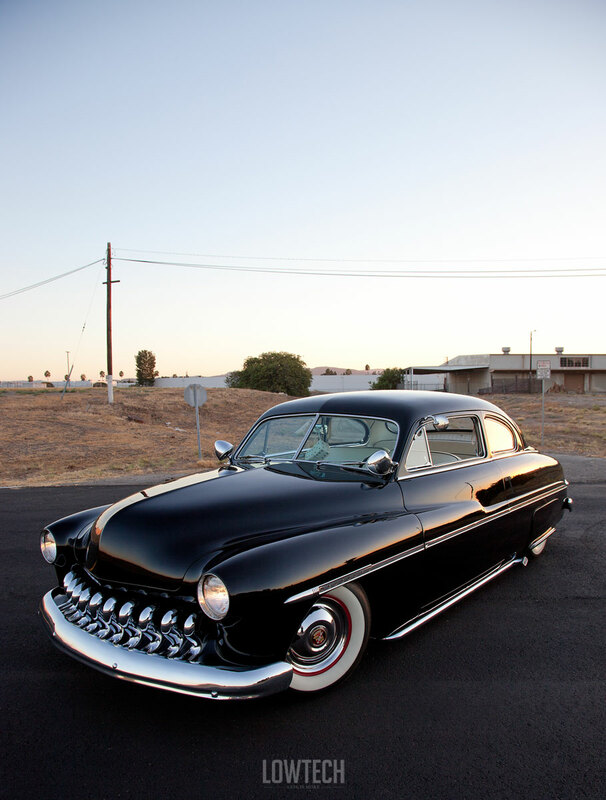 Shop owner Adrian Schmid replaced the sleepy original camshaft with a more spirited one and, while being at it, added a magneto ignition, Edelbrock cylinder heads, and an Edelbrock slingshot intake. The fuel pump is an original Ford part with a beautiful old viewing glass. 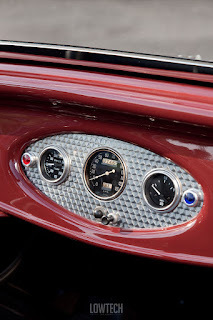 This is another one of the many little details that in their entity really make the authentic look of this roadster: starting with the cloth-wire, to the various bakelite parts like the spark plug connectors, or the starter solenoid. 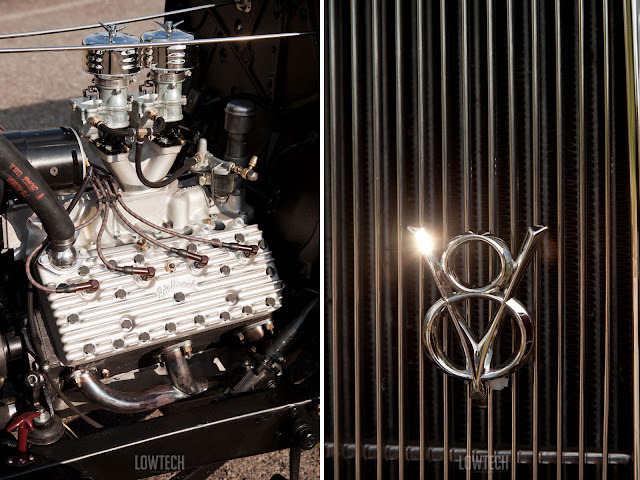 After the updated engine had found its new place in the freshly restored chassis, it was time for the body. In terms of metalworks, there wasn’t much to do – thanks to Brookville. So, Jürg was able to fully focus on the color choice. He was really fond of Washington Blue – an original hue from Ford he had seen on the very 32 Roadster from Sweden that had inspired him to build his own roadster. 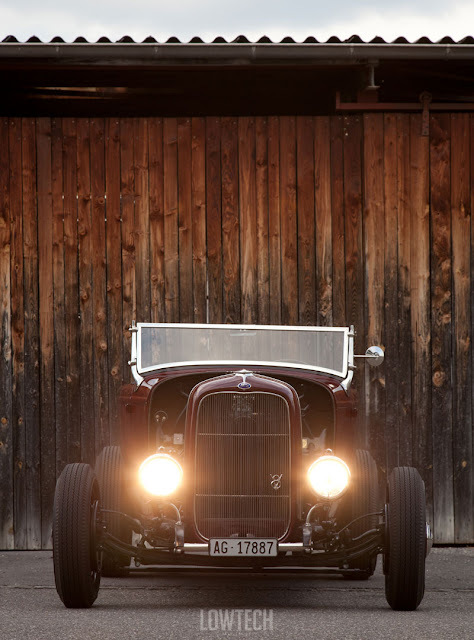 The paint guy from the Carrosserie Soland in Lucerne quickly provided him with a sample, but in the meantime Jürg had made a fateful discovery: He had removed the Ford emblem from the original grille shell and underneath, there were traces from the original factory color: maroon red. That put a quick and definite end to the blue era. 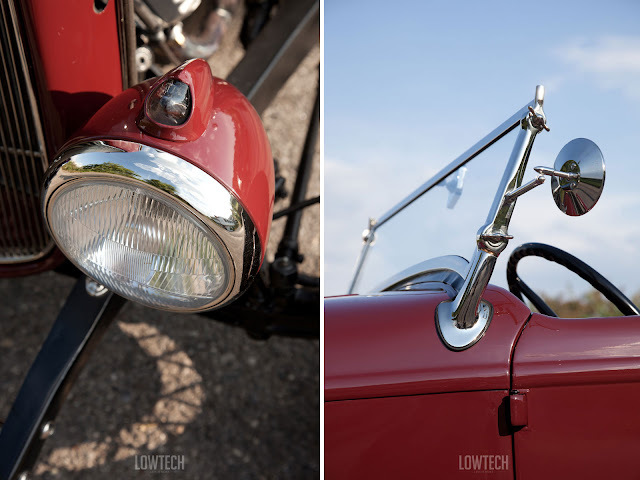 While the roadster body was being painted in the original red of the grille shell, Jürg took care of restoring the trim. Same here, he wanted everything to look and feel as period as possible. That’s why instead of chroming the parts he opted for nickel-plating. While chrome looks very bright and clear, nickel has a slightly yellowish glow. So, all the shiny parts got a nice flawless nickel finish: the grille, the headlight trim rings, the trunk handle, the windshield frame and even the air cleaners on the Stromberg carbs. 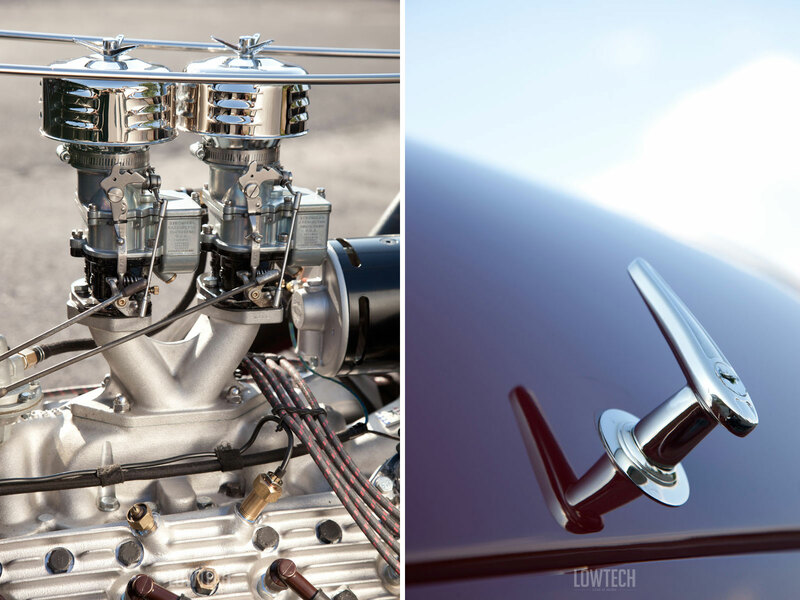 A very slight difference at first sight, but it really adds to the hot rod's distinctive attitude. 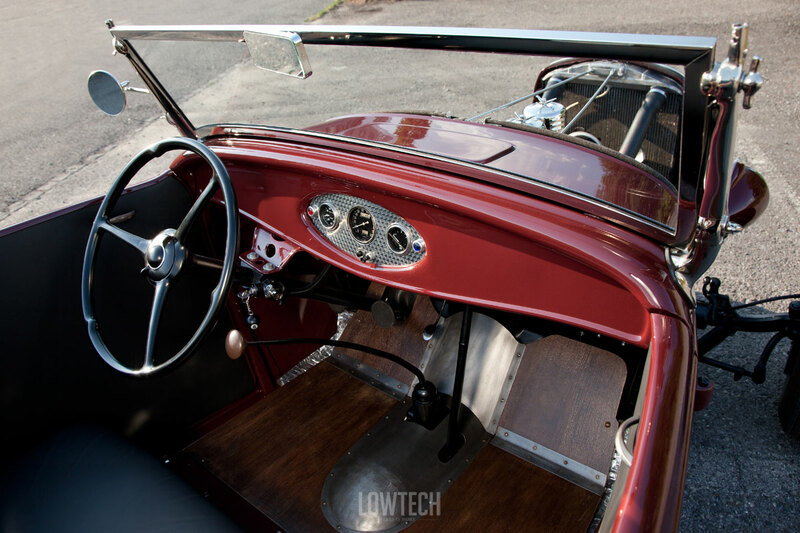 The finishing touch of Jürg’s roadster is the subtle, tastefully designed interior. 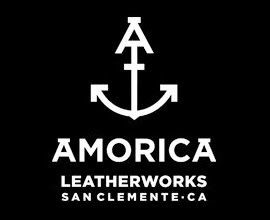 Following his philosophy of less is more, he only choose a few, but carefully selected materials. The local upholstery guy took care of covering the bench seat and the door panels with leather. 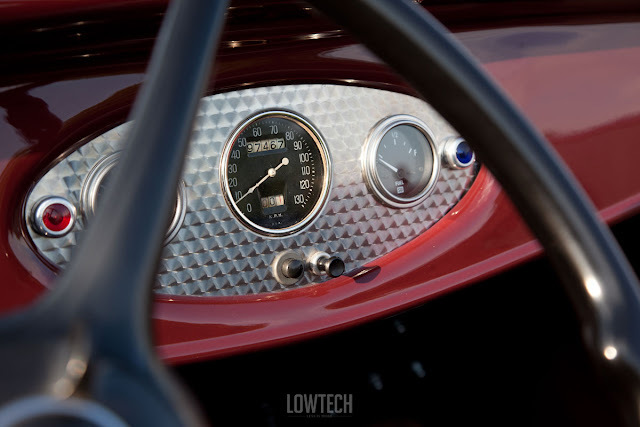 The steering wheel is an original Ford item, as well as the European spec kilometers-per-hour speedometer, sitting in the middle of two Stewart Warner instruments. And that’s about it. 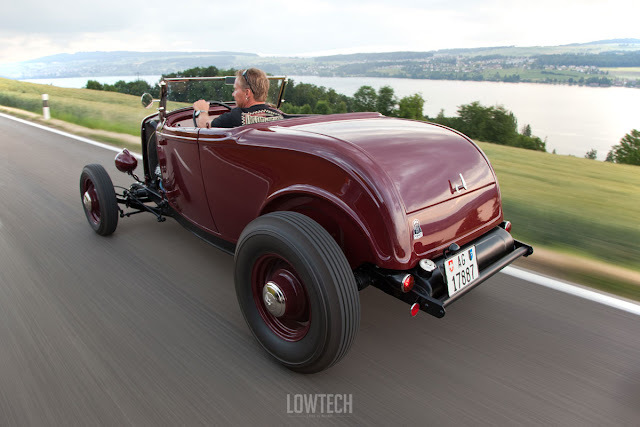 There are simply not that many other parts on a roadster, so there’s nothing left to do for Jürg except for enjoying his hot rod every free minute. And that’s exactly why he built it – right down to the smallest detail.